Tickets will be available from next Monday (25 February)! For years, King Shahrayar has taken bloody vengeance against the women of his city, marrying a new bride every night and killing her in the morning. Shahrazad is determined to stop the bloodshed using the only weapons she has - her wit and imagination. 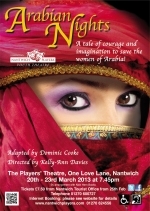 Night after night, the King's newest bride weaves tales of intrigue, silliness and suspense. How long can her stories save her? This high-energy youth theatre production will enthrall audiences of all ages with traditional tales such as Ali Baba, The Little Beggar and Simbad The Sailor performed in a modern style.